From late in the Swedish TV series's first season, Kurt Wallander: Jokern is one of the liveliest so far. There's a visiting cop, Frank Borg, who is more like an American loose cannon type cop (or perhaps a Gene Hunt-type) than is typical in this series or in Scandinavian crime fiction generally. 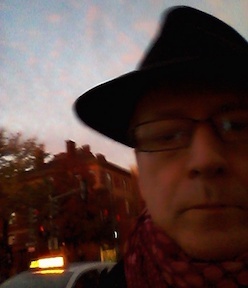 Borg is implicated in the murder of a restaurant owner in Ystad and a theft from The Joker restaurant in Malmö, an establishment with organized-crime connections. There are numerous twists and turns in terms of the identity of the murderer, and Stefan (played by Ola Rapace) has a bigger role than usual (albeit showing him following the lead of the rogue Borg in an way that at first is unflattering to Stefan and ultimately career-threatening). 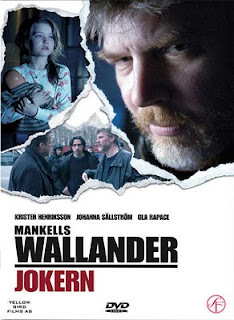 Wallander (Krister Henriksson) is spiky in this one, frequently irritated by Stefan, Borg, and the organized crime figures in Malmö, as well as irritable toward his daughter Linda--perhaps in fact a bit closer to the Wallander of the novels than is typically the case in this TV series. There is a fleeting, comic homage to Sjöwall and Wahlöö's Beck novels, or more specifically to the film made of The Abominable Man (retitled as Man on the Roof) by Bo Widerberg: Borg says to Stefan that someone they have under surveillance is always in uniform, like "that character in Man on the Roof" who even wears his uniform at home, off duty. Perhaps Borg is more likely to have seen the movie than read the book, but the reference to the film rather than the novel also pays homage to Widerberg's movie, recently singled out in interviews with Sjöwall as the only adaptation of the Beck character and the novels that was in her mind satisfactory. Jakob Eklund, as Borg, is rather prominently featured in the poster seen here--perhaps a better-known "guest star" in the series? Or just a nod to the character's importance in this episode, perhaps. This episode, and the series, are in any case highly recommended.